I was thinking this week about some comments Julia, Beck, and Evelyn Van Nice had made about the avenue into Foxbank. According to the stories, it was a long approach. 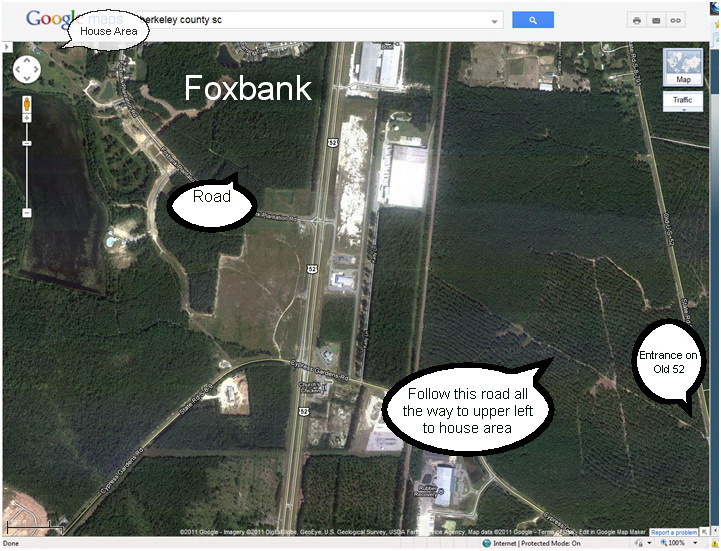 We now know Foxbank as being at the corner of Cypress Gardens Road and US 52. But if there was a long approach, it had to come from the Old Moncks Corner Road, or "Old 52." We all know that US 52 is a "new" 4 lane highway that has only been there since, what, the late 1960's? So I brought up an aerial view of the area to see if anything is discernable, and there it is... the evidence of a long approach from Old 52 leading in a straight line to where the house sat. Here is a screen shot from Google Maps. Current entrance to old Foxbank avenue on Old 52 (fall 2011).